Panaji, Nov 8: The national capital is so polluted that anyone who can survive in Delhi can survive anywhere, Goa Chief Minister Manohar Parrikar said on Tuesday. "The pollution in Delhi is so bad, that anyone who survives in Delhi, probably survives anywhere in the most polluted areas. 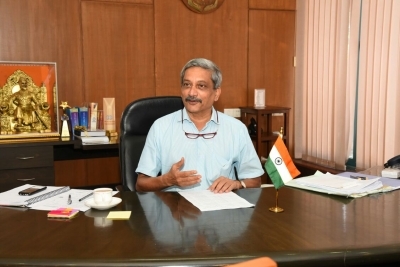 While Goa is so clean, that when I used to come back, I used to get cough and cold, because the system was trained from Delhi's air," Parrikar told a seminar on 'Indian Maritime Environment & Capability Requirement' organised by Confederation of Indian Industries here. Parrikar's quip came when he was recounting a challenge thrown to him by a media person some days back, asking himn to live in the port town of Vasco, where locals have been complaining of coal pollution, due to excessive import and handling of coal. The Chief Minister also said that latest readings showed that the pollution count in Vasco was "reasonable".